In a previous blog we have suggested that addiction may partly be the consequence of insecure attachment to our caregivers in early childhood and that as a result addicts often learn to attach instead to consuming substances, or behaving in certain “rewarding” ways such as gambling, hypersexual activity etc to cope with emotional distress and to regulate negative emotions. Recent research (1) has attempted to link the “hole in the soul” of early insecure attachment with the neurochemical oxytocin, known as the “cuddle chemical” or “love chemical”. “Recent research shows that the effects of oxytocin are more diverse than initially thought and that in some cases oxytocin can directly influence the response to drugs and alcohol. Differences in the oxytocin system can be based on individual factors, e.g. genetic variation especially in the oxytocin receptor, or be the result of early environmental influences such as social experiences, stress or trauma. Individual differences in the oxytocin system can influence effects of drugs and alcohol directly or indirectly. The oxytocin system has bidirectional interactions with the stress-axis, autonomic nervous system, neurotransmitter systems (e.g. dopamine, serotonin and GABA/glutamate). These systems are all important, even vital, in different phases of addiction. It is suggested that early life adversity can change the development of the oxytocin system and the way it modulates other systems…. individual differences in oxytocin levels, reactivity of the system or interactions with other systems can influence general resilience, drug effects and the susceptibility to develop problematic drug and alcohol use. The endogenous oxytocin system changes and matures over time as part of normal development. This paper postulates that individual factors and early external influences (i.e. parenting, stress and illness) affect the developing endogenous oxytocin system and its connectivity with other systems affecting oxytocin levels and alter responsiveness of the oxytocin system. 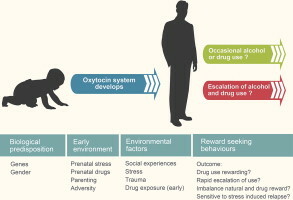 When an individual is exposed to alcohol and drugs in adolescence, these individual differences in the endogenous oxytocin system can affect reward seeking and drug use behaviour. It is postulated that for example drug use may be more rewarding resulting in an escalation of use; an imbalance between natural and drug rewards could affect the attractiveness of excessive drug use; individuals may be more susceptible to stress-induced relapse to drug use. Studies going back to the 1980’s have shown that oxytocin is able to affect drug effects and addiction processes (Ibragimov et al., 1987, Kovács et al., 1985 and Kovács et al., 1998). Most current studies focus on the effects of exogenous oxytocin on drug effects and relapse, however, individual differences in the endogenous oxytocin might explain some of the individual differences seen in susceptibility to addiction. Moffett et al. (2007) reviewed animal studies studying the long-term differential effects of distinct maternal separation protocols; these showed long-term effects of separation on subsequent alcohol intake patterns. In mice, prenatal stress has also been associated with a greater motivation for, and consumption of, alcohol in adulthood. Human studies have also focussed on gene and environment interactions affecting drug abuse and addiction. As one example, longitudinal data from epidemiological studies indicate that experiencing maltreatment and cumulative stressful life events prior to puberty, and particularly in the first few years of life, were associated with an early onset of problem drinking in adolescence and with an increased likelihood of alcohol and drug dependence in early adulthood (Enoch et al., 2010). Recent developments in genetic research and imaging have advanced the capacity to study the biology of human addiction. Major life events or traumas may also increase the vulnerability to develop drug dependence. Among the factors that have been implicated in addiction are sensitivity to reward (for example, polymorphisms in the dopamine receptor), differences in enzyme activity (for example, alcohol metabolism) and social factors (such as peer and parental attitudes). Addiction is a complex disease regulated by a number of genes. The main emphasis in recent years has been on the role of gene by environment interactions (Enoch, 2011 and Enoch et al., 2010) and on the effects of polymorphisms in genetic pathways (Reimers et al., 2012) that are involved in the neurobiology of addiction. One step further would be to examine epigenetic changes; for example, due to oxygen deprivation during birth or continued use of drugs of abuse which may have epigenetic consequences, which in turn would alter gene expression (Caldji et al., 2011, Maze and Nestler, 2011 and Renthal and Nestler, 2008), with potential consequences, for example, for sustained drug dependence.